However, the Doha declaration does not take a decision on whether countries with insufficient or no manufacturing capacities in the pharmaceutical sector will be allowed to import generic drugs to deal with a health crisis. Instead, it calls upon the trips council to 'find an expeditious solution' to this problem, and report to the wto general council before the end of 2002. Another reason why the trips agreement is considered a thorn in the side by many developing country governments is that the accord does not recognise and protect traditional knowledge held by communities. This runs contrary to the provisions of the Convention on Biological Diversity (cbd), which calls on countries to respect, preserve and maintain knowledge, innovations and practices of local communities , and also to encourage the equitable sharing of benefits arising from the utilization of such knowledge . cbd emphasises that local communities should have control over their biodiversity-related traditional knowledge and 'informal' innovations. On the other hand, protected by the trips regime, pirated resources and traditional knowledge have immense and growing value for private Northern companies. Genetic resources provide the foundation for a range of new products and technological applications in biotechnology, agriculture, and medicine. Knowledge developed and held in local communities can provide genetic material for plant breeders to produce new plants with resistance to pest or drought. In one case, incorporating disease resistance from a Latin American corn variety spared us corn crops from devastation and saved the industry an estimated us $6 million. Although article 27.3b of trips allows countries to exclude plants and animals from patents where the prevention within (national) territory... is necessary to protect ordre public (law and order) or morality , it stipulates that countries that opt for this clause must provide for a non-patent sui generis form of protection to plant varieties. The issue, which has often been raised in the past at the wto forum, was raised once again in a paper presented in August this year by a group of African countries. The African paper questioned mandatory patenting of life forms and natural processes. 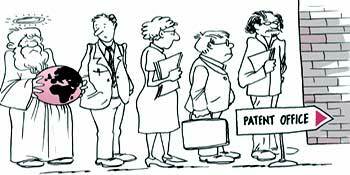 It argued that only inventions are patentable, not discoveries which the above two represent. Allowing the patenting of discoveries would encourage western corporations to steal and monopolise traditional knowledge and natural resources. The proposal sought a review of trips to protect innovations of indigenous and local farming communities, and allow the continuation of traditional farming practices. This includes the right of farmers to save and exchange seeds and sell their harvests. The Doha declaration asks the trips council to examine the issues relating to the links between trips and cbd and protection of traditional knowledge and folklore, although no definite deadlines were set for this task. The issue has already been examined in the past -- with no concrete results -- by the wto Committee on Trade and Environment (cte), the trips council, cbd , the Food and Agricultural Organisation (fao), the un Committee on Trade and Development (unctad) and the World Intellectual Property Organisation (wipo). 'Geographical indications' are used to indicate the regional origin of particular agricultural or manufactured goods, provided that those goods derive their particular characteristics from their geographic origin. Under the trips agreement, a geographical indication is recognised as a form of intellectual property, but currently geographical indicators protection is granted only to wines and spirits. So, for instance, only wines from the Champagne region of France can be called Champagne, and Scotch whisky can only be made in Scotland. The Doha declaration agreed to further this protection, by negotiating the establishment of a multilateral system of registration and notification of geographical indications for wines and spirits before the next wto ministerial conference. Several countries have, in the past, pushed for such protection to be extended to foodstuff, agricultural and industrial products, and even handicrafts. This would allow for products such as Roquefort cheese, Darjeeling tea, and basmati rice to also be protected under geographical indications. Many see geographical indications as a means of protecting small-scale production of goods based on traditional know-how. In October this year, India and Switzerland jointly submitted a paper to the wto demanding that trips scope be extended to protect gi relating to agricultural products. The Doha ministerial declaration calls upon the trips council to look into the issue.